Does a click track help or hinder worship? During my 8+ years of piano lessons, I found some moments to be enjoyable and others not-so-much. Especially when my piano teacher would pull out that darn metronome. I thought musicians were supposed to be creative, go-with-the-flow type of people…and was convinced that this nagging click could in no way make me a better musician. I carried this same belief with me as I started to lead worship. There was no way I was going to let a metronome find its way into rehearsal. We were going to be real musicians, the kind that jam and simply feel the music. A few years later, I was studying a large church that I looked up to so I could learn and become a better worship leader. Lo and behold, they used a click track – not just during rehearsal, but during worship as well! I couldn’t believe it. I decided to give the click a shot. Although I was excited to try something new, the band wasn’t in agreement. No one on the team had ever played with a metronome so it was quite the struggle. But, we kept at it and mastered it a few months down the line. Just like with anything else, diligent practice will always yield new and improved skills. From this point forward, we always used a click track during rehearsal, but we did not start using it during worship for several years – mainly because we did not have in-ear monitors. Starting with the drummer, we began to transition to in-ears. Now, all instrumentalists have in-ears and we use the click during rehearsal and worship. It puts the drummer at ease. If you have ever played drums, you understand the pressure of being the one who keeps everyone in time. The click track relieves this pressure by providing a stable foundation for the drummer to follow. Plus, they no longer have to guess as to whether or not they start the song at the right tempo. Builds within songs deliver maximum impact. We have all heard (and maybe been a part of) a band rushing through an eighth note build. It looses its impact as musicians struggle to stay together and do not hit that final note at the same time. It is natural for us to want to speed up as a song is building, but the click track will help us stay on point. Remember, a consistent and accurate build creates a powerful experience. The band experiences a new level of unity. Have you ever experienced a situation where two musicians were fighting for the tempo? Or, maybe the lead vocal was trying to speed the song up instead of following the drummer. The click track takes away this fight as there is no longer a question as to who is playing at the right tempo. Although the click is a must for musicians who really want to master their skill, it is important not to become dogmatic. You should definitely use it most of the time, but also know when it is time to turn it off. If you are in worship and the band is fighting the click, turn it off. If you are in an amazing, unplanned worship moment, it is okay to turn it off and let things ebb and flow. Start simple. There is no reason to jump into learning to play with a click while adding other things (such as loops or multi tracks) all at the same time. Simply use an app on your iPhone (I use Tempo – Metronome with Setlists) and start with the click only. Use only in rehearsal (at first). It is going to take time for the band to get comfortable with the click. So, the last thing you want to do is plan a train wreck by using the click during service before the band is ready. Prepare for outbursts of wrath. There are going to be band members that HATE the click (maybe even your drummer). 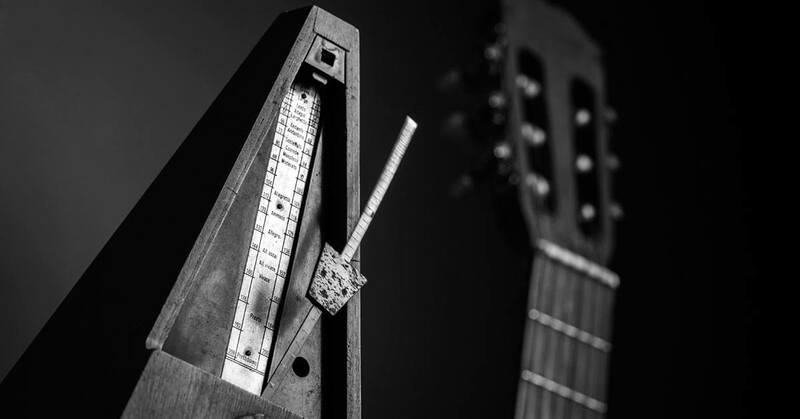 Metronomes have a way of showing a musician their flaws, which is not a pleasant experience. For those getting discouraged, simply remind them that after a bit of practice, they will get it. Also, encourage them to use a metronome when practicing at home. Find the right sound. Most metronome apps have different sound choices. Filter through them to find which one the band likes best. There are some sounds that get lost in the mix, and others that hurt your ears. But, you will find one or two that work really well in your situation. Subdivide when necessary. When you are new to the click, it can be hard to play along with just the quarter notes, especially in a slower song. Most metronome apps (including Tempo) allow you to subdivide into eighth or even sixteenth notes. When the band is having a hard time with quarter notes, give this a shot. Eventually, you will be able to knock it back down to quarter notes. If you haven’t been using a click, now is a good time to get started! As always, if you have any questions or want to share your experience with a click track, feel free to use the comments below. Love your site, Kade! As a brand new Worship Minister, I find your slice of knowledge so helpful. We went to clicks out of necessity, as we lost a vital keys player to “retirement”. It’s been such a HUGE help in our sets. I no longer have to worry about where the band is in the song and where they are going. We are all together thanks to that nice little “voice in our heads”. I’d love to know how you handle transitions using click and back tracks. I’m currently using the “Prime” app through LoopCommunity, and that’s one area that we struggle in: transitions. Thank you sir! Keep up the good work. Thanks for the comment, Jordyn! We currently only use a click – no backing tracks. I am considering giving backing tracks a try, but haven’t ventured down that path yet as I am happy with the sound I currently get from the band alone. But, I like to try new things, so I will give it a shot one of these days. I wrote a post about transitions a few weeks back: 3 Ways to Improve Transitions Between Songs in Worship. Although this doesn’t address the use of backing tracks, you may find the information helpful. OnSong is a great app for using click and track together… as you swipe through each chart in the let, the click and track automatically transition to presets. One guitarist I have worked with bought a bulk pack of pads in all keys. It plays as a constant track and auto starts when he swipes to the next song. He starts click manually when ready. It allows for a simple transition with constant sound and easier transitions since no one has to actually play that! Thanks for the comment, Jackie! Very helpful. Hi Kade, thank you very much for this helpful article. I play mostly drums in our church and we use IEMs and try to implement a click track at the moment. I face the problem of not knowing how to dial the Click in my mix so that I can still hear it with full band playing. I figured some clicks sound too flat to get heard in the mix, while others sound more edgy and you can hear those better. Still I get lost sometimes because I won’t hear it well enough. So is it just a matter of volume or what tips do you have for that? How can I make it stand out without being too loud/annoying during more silent parts of a song? Hope that makes sense. Thank you very much, God bless you, greetings from Germany. Hey Niklas – If your IEMs have panning capabilities, try panning the click to one side or the other. This will help separate it from the rest of the mix and may solve your problem. I’m not 100% convinced. I was in a pop band in the 90s that played backing midi tracks to a click. It worked, the audience didn’t notice. Fast forward to now, my praise band has iems, uses a click and is starting to use backing tracks. At first, even though I had been used one I fought it. Now I see the value in consistent computer tempo, but it does rob you of feel. We have started using backing tracks. Our Sunday morning band is fantastic. We have 2 guitars, piano, keys, drums, bass, multiple singers. We don’t need it, and I cringe when I hear extra stuff in my ears. Maybe if we needed it, but the stuff it adds wouldnt be missed if it wasn’t there. For me, unless its a computer generated arpeggiator, or something like that makes the computer the instrument, I wouldn’t do it if I was the leader. That’s just me, and being over 50 may have something to do with it. That being said, seeing Chris Tomlin live would be lacking if he didn’t have the Lecrae raps in his songs, even though Lecrae didn’t tour with him. Then again, I watched Dire Straits doing Tunnel of Love on YouTube the other day from the 80’s. You watch that and it makes you reconsider everything except excelling at your instruments. Hey Patrick – I definitely agree that backing tracks shouldn’t always be used. On most songs, we only use a click to keep us on point. We do bring in backing tracks for certain songs, but only to add pads, synths and other keyboard sounds instead of adding another keyboard to the stage. Church is not the music industry, it’s a place to worship. I cannot concentrate with that nonsense in the background. Tried it and it drove me absolutely crazy in a few seconds! I will quit a team that thinks about bringing it in and I will NEVER join one that has it. Who ever said that church music needed to be so complicated? Simple un-perfect timing worked for 2000 years and I’m okay with it. Musician for over 40 years. Using a click track has made our worship band more unified. From the start it improved our playing together, and helps us to be more skillful. It allows us to relax, play the music and focus on worshipping. It hasn’t limited our abilities and our worship, it frees us to do better what God has gifted & designed us for. Still, at times we might kill the click during a set so we can flow with the moment. Planning & practice ahead of time, with sensitivity and alertness in the moment can make this work to extend those sweet worship times before jumping back to the click for the next song. Our process was to first introduce the click in our weekly practice. It took some adjusting for a few weeks. We settled into the process, then began using it regularly for worship time. Now it’s just a part of our routine. Other than some initial tech issues (monitors, mixes), it has worked great for us. The drummer runs the Metronome by Soundbrenner app to our in-ear monitors. The app lets you tap in real time or dial adjust as needed. Time signature, subdivisions and sounds can be easily changed. We save tempos to a library, available to build lists for worship sets. And too much click, or feeling isolated from the stage/room presence? I often pull one IEM out to keep a pulse on the click but take in more of the ambient sound. The best of both worlds! Thanks for being a great resource, Kade. You’ve been an awesome influence in improving the ministry of the worship & tech teams at our church. Thanks for the feedback and kind words, David!